Back from hiatus! In On My Wishlist I spotlight books that I'm really looking forward to. I know there's a meme Waiting on Wednesday and there even are others, but I'm going to rebel and do it how I want it (hehe). I'll feature the synopsis as posted on Goodreads and put a linkie to the Goodreads page of the book. 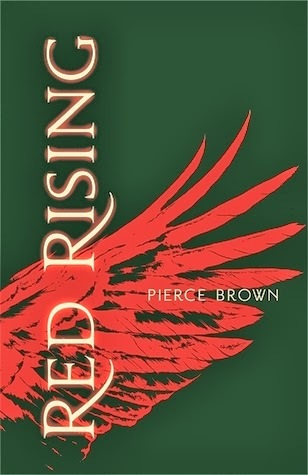 This week: Red Rising by Pierce Brown. Until the day Darrow, with the help of a mysterious group of rebels, disguises himself as a Gold and infiltrates their command school, intent on taking down his oppressors from the inside. Can we just take a moment and let that synopsis sink in? *waits* Yes, that's what I thought. This sounds beyond amazing. It sounds like an actionpacked Sci-Fi that I need in my life. I was under the impression that it wasn't being published for a few weeks, so I only just realised it's already published so.. Excuse me while I wander off to order my copy. What I like is how complex and well-thought the blurb sounds. Promising for the story :D!